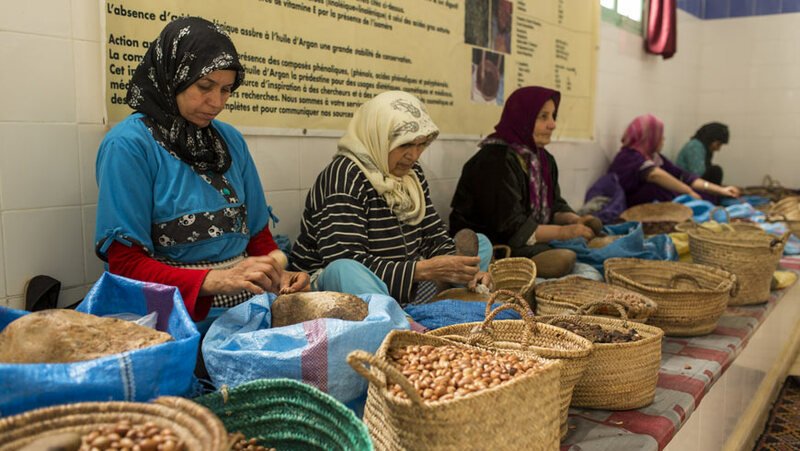 From Pakistan, where investing in women as clean energy entrepreneurs has led to avoidance of CO2 emissions, to supporting more sustainable land management practices and improving biodiversity conservation by working with women’s cooperatives in Brazil and Morocco, UNDP and the Global Environment Facility recognize the importance of gender equality. Gender equality is an environmental issue. Through initiatives financed by the Global Environment Facility, UNDP recognizes this reality on the ground around the world. From Pakistan, where investing in women as clean energy entrepreneurs has led to avoidance of CO2 emissions, to supporting more sustainable land management practices and improving biodiversity conservation by working with women’s cooperatives in Brazil (fruit, seed and palm processing), Uganda (shea butter) and Morocco (Argan oil), to strengthening national climate strategies by working with governments to develop gender responsive National Communications, advancing gender equality and women’s empowerment delivers environmental results. Numerous studies show the transformative potential of gender equality to advance environmental sustainability. UNDP evidence confirms that women’s empowerment often means greater protection of the environment, including stronger environmental policies and less land degradation. Research in Nepal points to the beneficial impact of women’s participation on conservation outcomes. GEF-financed UNDP-supported projects from Mexico to Mozambique have embraced specific gender strategies to advance their environmental outcomes. That’s why the GEF’s newly revised Policy on Gender Equality is so important. The policy moves away from a ‘do no harm’ to a gender responsive approach – one that introduces specific actions to support gender equality and the empowerment of women – and demonstrates that the GEF recognizes this approach as an operational imperative and catalyst for change. The policy was spearheaded in by the GEF Gender Partnership, comprised of gender experts from GEF Partner Agencies, secretariats of the MEAs, and representatives from the GEF Independent Evaluation Office, the GEF CSO Network, the GEF Indigenous Peoples Advisory Group, other environmental finance providers and organizations, and led by GEF’s gender specialist. UNDP embraces a gender responsive approach through its own Gender Equality Strategy, which places advancing gender equality and women’s empowerment at the center of its development mandate. UNDP also deploys key accountability mechanism such as the UNDP Gender Marker, which tracks investments and expenditures in gender equality, and the UNDP Country Office Gender Seal, a quality certification process that assesses and improves the ability of UNDP Country Offices to deliver on gender equality. For its GEF-financed portfolio, UNDP measures and reports annually on progress in addressing gender inequality while at the same time delivering and enhancing environmental benefits. In 2016, 74% of projects in UNDP’s GEF-financed portfolio were mainstreaming gender considerations and advancing gender equality. 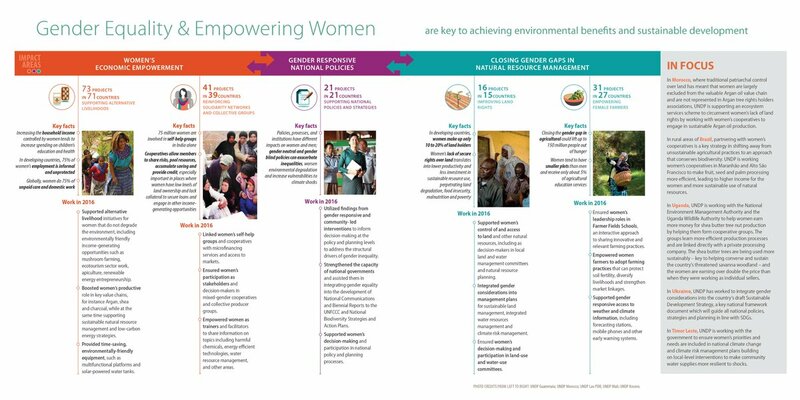 These results were reported in over 100 countries and covered three interrelated impact areas: women’s economic empowerment, gender responsive national policies and closing gender gaps in natural resource management. We know that our planet’s most pressing challenges won’t be tackled without addressing the key drivers of environmental degradation. Gender inequality is one of these drivers and the GEF’s new gender policy is aiming to do something about it.